We've shared artful photos with you in the past of bullets cut in half, food cut in half, and even golf balls cut in half, now here's something a little less artful, perhaps, but just as powerful. 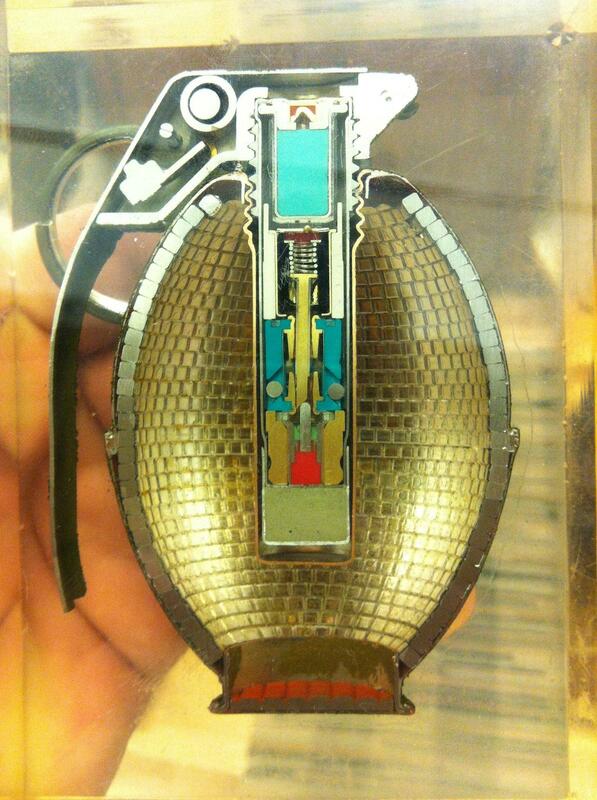 It's an image of a fragmentation grenade cut in half, which was recently posted on Reddit. Quite a few commenters on Reddit have weighed in with what they think the various bits inside the sliced grenade do, but we like this description by Yonatan Zunger, a chief architect at Google. In a post on Google+, Zunger says what were are seeing in the image is the inside of an M26A1 fragmentation grenade. "The pin is visible as the ring behind the grenade, at the left, and the pin which is sticking out through the handle," Zunger wrote. "Its role is to hold the safety clip in place. When released, the clip can fall off (when throwing it, you grip the clip in your hand and pull the pin; as it leaves your hand, the clip falls) which lets the hammer (diagonal line at left) move on its spring and whack the primer. (Orange stuff and triangle at the top center) This lights the delay charge (bright turquoise) which burns for three seconds; at the end, it releases the clips (blue and gold) which are holding the spring (coiled at the center) fixed. This pushes down the striker pin (the golden rod at the middle) so that it strikes the primer charge (red) which sets off the initiator charge (greenish-gray). This, in turn, will detonate the parts which were removed from this grenade: booster charges of very fast explosive (tetryl) which are wrapped around the cylinder, and Composition B which fills the entire body of the grenade, the main explosive. The golden squares which you see around the rim are actually a single coil of wire which wraps the whole mechanism and which has been notched into cubes. These cubes are torn apart by the explosion and fired off as shrapnel in all directions. It's surrounded by a thin sheet of metal that holds it all together. The result is designed to kill or maim anyone within 15 meters when it goes off. Why am I going through all this? I think it's because the dissonance between the beauty of the item and its nature. I remember a similar feeling as a child, when I was quite obsessed with nuclear weapons. (A side effect of growing up during the Cold War; I could recite for you, in great detail, the effects of nuclear explosions, the models of weapon, and where they were likely to hit) They have a beautiful, elegant simplicity, and produce something which genuinely strains the outer ability of the human mind to comprehend. And that something is destructive. We are attracted to and repelled by death, in all its forms."